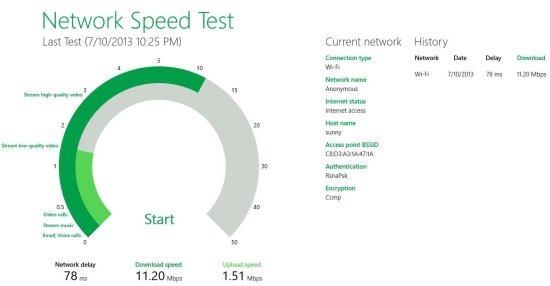 Network Speed Test App is a free Windows 8 App to test network speed statistics. There are several websites to check your internet speed; but how about an app easy to launch from your start screen to check the internet speed and it’s statistics. Microsoft itself has designed an app to check your network statistics. And obviously this app needs an internet connection to run and show the results. Let’s know more details of the app in the following review. Network Speed Test app was first built for the Windows phone and recently released for Windows 8 PC too. Many Internet Service Providers promise you with some maximum speed. But sometimes you don’t experience the speed that was promised. This app is useful in such times. This app is very simple to use as it has only one function i.e., to check your internet speed. As you can see in the above picture, there’s a speed meter and to the right is the details of current network and history. Test your network: Click on the Start button and then the meter goes up and fluctuates at a point and shows the download speed of your internet (in dark Green color). Then the same happens with upload speed (in light Green color). Also the Network delay time is shown. Current Network: In current network the connection type, name, internet status, host name, access point, authentication, and encryption is shown. History: In history section the app shows the previously tested network details. It shows the network, date, delay, download speed, and upload speed of that network. This is developed by Microsoft itself. View the statistics of your network using this app. Click open this link and use the view in Windows Store option to open the app in store app. Then click on Install and use the app. This app has minimalistic features and functionality but an useful one. 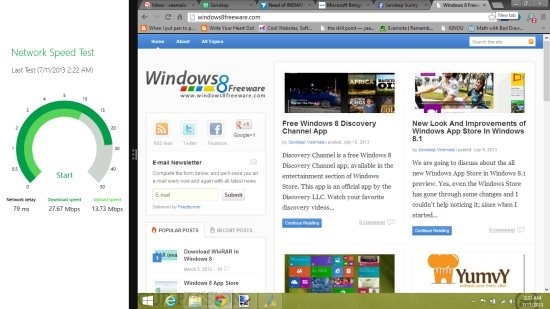 Here are some other useful reviews like: Discovery Channel App and About Windows 8.1.